We were recently up in Elora to go tubing. Faced with the drive back to Toronto in the early evening rain and some very hangry people, we decided to pop into Elora Brewing Company for dinner and a few beers. This is the place to hang out if you’re in Elora – every seat was filled. We satisfied our hunger on fried chicken and burgers, and for the non-drivers, a lot of beer. I brought mine home from the bottle shop, since I was driving. 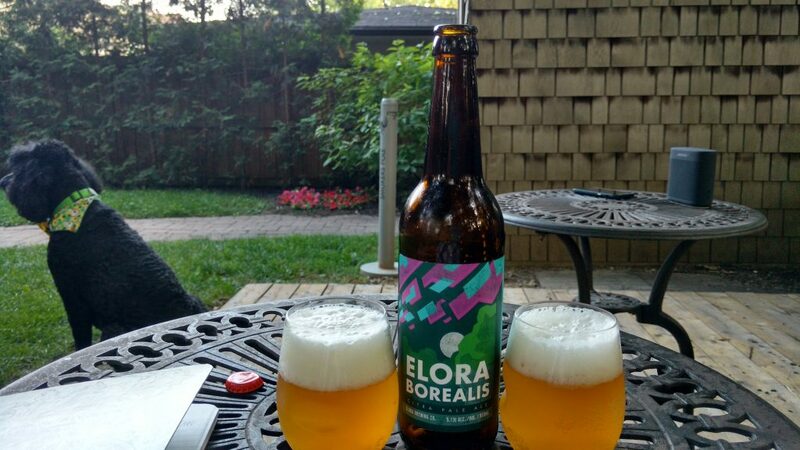 Elora Borealis pale ale is available at the bottle shop and finer LCBO locations around the province, and a 500 ml bottle retails for $4.50 at the LCBO and weighs in at 5% ABV. My bottle was packaged on June 6 and I was a little surprised to discover this when I sat down to drink it, since I only hoarded it in my fridge for a week before drinking it. We served ours in (plastic) stemless white wine glasses on the patio, because that’s where beer should be enjoyed in the summer. I particularly enjoyed the name of the brew, since a solar flair was supposed to make aurora borealis visible to parts of southern Ontario this week. Appearance: Deep yellow colour, lingering thick white head, unfiltered. Aroma: Mango, grapefruit, and canned peaches. Taste: Light but noticeable malt backbone. Hop forward from all the lovely citra hops used. I remember it tasting hoppier on tap in the brewery, must have been a fresher batch. Aftertaste: Hints of pine, mostly citrus from the hops. Suggested food pairing: The label recommends through cute pictagrams pairing this with salad, chicken, shrimp, and what I can only assume is pasta. I paired mine with fried chicken at the brewery and relaxing on the patio at home. Overall: A solid brew to have as their flagship. I still prefer it on draught but it’s a lovely brew.